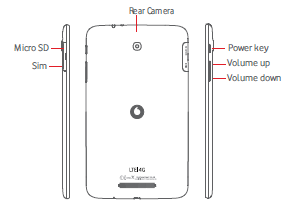 The Vodafone Smart Tab 4G User Manual provide many information for example about Keys and connectors phone, Set-up Inserting the micro SIM card & the microSD card, Set up your tablet for the first time, using home screen, Using the touchscreen,learn about Quick setting panel, Lock/Unlock your screen, and more. 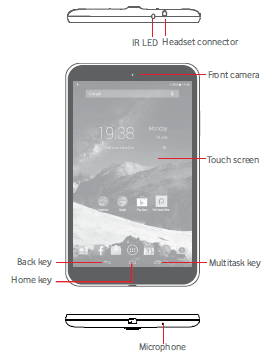 Then about Using Onscreen Keyboard, using contacts, Contacts importing, exporting and sharing, using Gmail, Hangouts, turorial how to Connecting to the Internet,Using Wi-Fi,Connecting to Bluetooth devices, VPN Settings, using camera on page 53, watch video, using maps, using Kingsoft Office, Peel Smart Remote, etc. Other impotant informations such as about Wireless & networks settings, Tethering & portable hotspot, security secttings, Backup and reset on page 74, Factory data reset, and more.